The Virunga Mountains consist of eight mighty volcanoes (two of them active) that straddle the borders of the Democratic Republic of the Congo, Rwanda, and Uganda. These lofty, often cloud-shrouded peaks are home to the critically endangered Mountain Gorilla, and vEcotourism’s Ian Redmond, OBE, has been among those leading the charge for their protection ever since his days as a research assistant with Dian Fossey on the slopes of Mount Bisoke. Please explore the map below to visit one of the three vEcotour sites we currently have online. You’ll clamber to the misty summit of Mount Sabinyo (site of the “discovery” of the Mountain Gorilla by Europeans), Step into a remote glade where Dian Fossey lies buried alongside her beloved gorilla friends, and join a group of ecotourists as they encounter the Susa Mountain Gorilla Group at close range on the flanks of Mount Karisimbi. Click on any of the green leaf icons to begin your vEcotour. Would you like to learn more about the Virunga Mountains area and what you can do to ensure the survival of the Mountain Gorilla? These links are just what you need! Headed to Virunga? 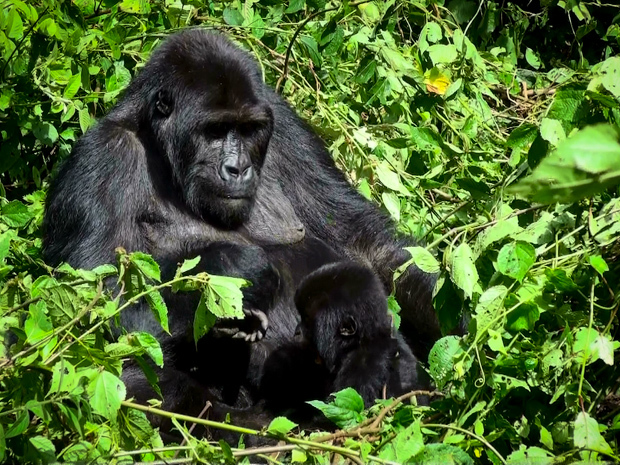 Contact the Rwandan Development Board to organize a Gorilla Trek of your own. To learn more about Mountain Gorilla conservation or to contribute to the cause, visit the Ape Alliance.